Jayarava's Raves: Here Be Dragons: On The Limits of Science. THOSE WHO RAIL against science usually make the same point: viz that science has limitations which stem from the nature of the human psyche and senses, and that there are places where "science cannot go". Some things are simply "not measurable" and consciousness is always at the top of the list of things not amenable to measurable. In theology this is known as the "God of the gaps" argument. Retreating in the face of the successes of science, some Christian theologians resorted to arguing that God was to be found where science ended: i.e. in the gaps between measurements. Some Buddhists (and others) argue that the "true nature" of consciousness (or reality, or whatever) is found only where scientific investigation ends. Consciousness is off the edge of the map: here be dragons (or nāgas in our case). However other theologians realised that the God of the gaps argument meant that as knowledge expanded, God shrank. Some of those who realised this preferred the even more irrational all-or-nothing argument: i.e. the whole universe was God's work. Buddhists who adopt a God of the gaps argument will find themselves increasingly marginalised as the scientific investigation of consciousness proceeds. Perhaps the first person to complain about the obsession of scientists with measurement, and certainly one of the most vociferous, was the poet and engraver William Blake (1757-1827). Blake saw visions of God, Jesus, and/or angels most days of his life. He conversed with his visions and to him they were as much a part of life as his wife, his few friends, his house, or the city of London where he lived. 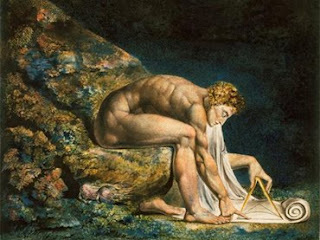 Blake hated Isaac Newton with a blazing passion, and the depiction of him (above) with his dividers doing geometry while ignoring the texture of the world around him, was ironic and polemical, though not the everyone seems to get this. For Blake the empirical approach could not measure the higher truth he felt he met in his visions. In his own time Blake was considered a (mostly) harmless crank, but later he was championed by arch Romantic and co-founder of the Pre-Raphaelite Brotherhood, Dante Gabriel Rossetti. Today (for good or ill) Blake would no doubt be treated as "mentally ill". In the wake of Blake we sometimes find Buddhists at the forefront of the attack on science and materialism, along with Christian fundamentalists, social studies scholars and French philosophers. Sadly the understanding of science in these attacks seems not to have progressed much beyond Blake's time, and we see scientists accused of seeking or claiming Absolute Knowledge, or thinking they can solve all the worlds problems. In fact it is religions which claim absolute knowledge (which they don't have) and the ability to solve all the world's problems (which they have demonstrably not done). Most people are distinctly better off for having science in the world, and recently Harvard Professor Steven Pinker has suggested, in his book The Better Angels of Our Nature, that the values of the Enlightenment have contributed to a long term reduction in violence across the globe. His claim is hotly contested, but one feels that with the retreat of Christianity a vengeful spirit is being exorcised from Europe. That there is a substrate of violent behaviour remaining should not detract from the achievements of Enlightenment values. Secularism and trade have created a more stable, peaceful and unified Europe than Christianity ever did (current problems not withstanding). But what of this claim that consciousness is inaccessible to science? I think this claim is now demonstrably false. The map is now a globe, we may not have every island and cove mapped, but we know the rough shape of the continents. Turns out there are no dragons. However before looking more closely at this issue I want to briefly mention another anti-materialist claim: that the brain is simply not complex enough to sustain consciousness. I had wondered about this, but I now think this is one of many failures of imagination on the part of the anti-science lobby. Part of the problem is that it's difficult to get a handle on big numbers. So if I say that the human brain has about 100 billions neurons each with 1000 connections to other neurons, i.e. 100 trillion connections in total, this doesn't really mean anything to most people. To get a sense of it there is a very interesting TED talk by Henry Markram which shows a visualisation from a realistic computer model of a tiny part of the brain of a rat. Here we are visualising a model equivalent to perhaps 1 ten-millionth of the human brain, and yet the complexity is both staggering and beautiful. Does a brain possess the complexity required to produce and sustain consciousness? I would say undoubtedly, yes, it does. And so to the idea that consciousness is not accessible to measurement. For many decades now neuroscientists have been studying the way that brain injuries affect consciousness, cognition, and personality. This has given us a rough overview of the way that mind depends on brain. More recently various types of brain scan have allowed us to begin to show in more detail the correlations between brain activity and mental activity, increasingly this is done in real time. We can be reasonably certain that mental activity is always associated with brain activity. Some studies in animals have gone to a much greater level of detail with brain mapping. One group have precisely mapped out each of the 300 or so neurons of a nematode worm and all of the synapses. They have produced the Worm Atlas to help visualise it. The effort to map out the 100 trillion connections in a human brain has been formalised in the Human Connectome Project. It seems likely that with persistence a complete map of a human brain and all its connections will eventually be realised. This will give us undreamed of insights into how the brain, and therefore the mind, functions. I glossed over some of the aspects of consciousness that can and have been studied when I reviewed Thomas Metzinger talking about the first-person perspective. This is one of the ways of studying of how consciousness, particularly self consciousness, is affected by injury. But some neuroscientists have gone further and created non-invasive, and non-destructive ways to test and challenge our sense of self. I've already described Thomas Metzinger's article which links the idea of a soul with out-of-body experiences (OBE), but the OBE provides other insights into the flexibility and contingency of our sense of ownership over our body. A recent feature article in Nature News surveys the life and work of Henrik Ehrsson in this area. Ehrsson uses virtual reality equipment to alter how the body is incorporated into the Self-Model. The self --that is the thinking, ego centre--can be experienced as transferred to an inanimate object for instance. That is to say that the sense of "I" being behind the eyes can be disrupted so that it seems to be located outside the body, and even inside an inanimate artificial body. Similarly inanimate objects can be incorporated into the body image to the extent that seeing them touched can produce a 'felt' sensation. This tells us that the sense of self is not hard wired, but virtual. Metzinger talks about it as a "simulation". As author and blogger Ed Yong says "Ehrsson's work also intrigues neuroscientists and philosophers because it turns a slippery, metaphysical construct — the self — into something that scientists can dissect." He also cites neuroscientist David Eagleman: "We can say if we wobble the signals this way, our conscious experience wobbles in this way. That's a lever we didn't have before". And Thomas Metzinger: "There are things like selfhood that people think cannot be touched by the hard sciences. They are now demonstrably tractable." The field of neuroscience has made huge progress in the last 20 years. News of this progress leaks out in popular press coverage only to a limited extent, and often with distortions. More can be gleaned from popular books by authors such as Vilayanur Ramachandran, Oliver Sacks and Antonio Damasio (to name some of my favourites). But look at the bibliographies of such books, or do a Google scholar search and you'll get a better idea of the scope and scale of the enterprise. Lay people can scarcely imagine it, and even with my degree in chemistry I cannot follow the great bulk of it, and must rely on interpreters and popularisers to get a sense of what the scientists are discovering. Of course for Buddhists some of the most interesting research in this area is the study of how meditation affects the brain in the short and long term. We are now getting information about which parts of the brain are activated by different styles of meditation, and how regular meditation practice creates long term changes in the brain. It is these kinds of studies, with objective evidence of benefit that relies on data and not metaphysical claims or mere subjectivity, which are helping to popularise mindfulness techniques (including meditation) beyond our usual audience. It seems to me that the perceived limitations of science are often in fact the limitations of the perceptions of the critics of science. In the Romantic critique of science there, ironically, seems to be a massive failure of imagination, and inability to take in and think about what is actually happening in the world. Very few critics seem to have understood the impact of the two great figures of the philosophy of science in the 20th century: Karl Popper and Thomas Kuhn; let along the progress of knowledge itself. Too many seem to ignore the various revolutions in thinking that have occurred in the years since Blake vented his spleen at the great figures of the Enlightenment. In my view Blake is not a good role model. He may have been a Romantic figure--a lonely visionary, enunciating a higher truth that lesser mortals could not comprehend --but he was unable to sustain relationships with his friends for instance, and was patently a very frustrated and angry man, who blamed his inability to communicate on others. Blake was no saint, and, in the end, not much of a prophet either. Humans have limitations, but one of the stand-out characteristics of humans is not accepting those limitations and pushing beyond them. So, yes, science has limits, but they are not set by outdated views, and ideological criticism. We are usually limited only by the scope of our imagination. 'The Scientific Method.' In Our Time (with Melvin Bragg). BBC Radio 4. 26.1.12. Podcast mp3.
' The Age of Doubt.' In Our Time (with Melvin Bragg). BBC Radio 4. 9.3.00. Podcast mp3. 'Henry Markram builds a brain in a supercomputer' TEDGlobal. Jul 2009. 'Gero Miesenboeck reengineers a brain.' TEDGlobal 2010. Neil Burgess: 'How Your Brain Tells You Where You Are.' TEDSalon, London Spring 20011. Jayarava. First Person Perspective - precis of a lecture by Thomas Metzinger. Yong, Ed. 'Out-of-body experience: Master of illusion.' Nature News Feature. 7 Dec 2011.